WSRE Public Square and Pensacola State College present Cynthia Barnett: "Blue Revolution: a Water Ethic for Florida"
WHO: Cynthia Barnett is an award-winning environmental journalist who has reported on water and climate change around the world. She is the author of three acclaimed books on water: “Mirage: Florida and the Vanishing Water in the Eastern U.S.,” “Blue Revolution: Unmaking America’s Water Crisis” and “Rain: A Natural and Cultural History.” She has written for National Geographic, The New York Times, Los Angeles Times, The Wall Street Journal, The Atlantic and many other publications. She teaches environmental journalism and nature and adventure writing at the University of Florida. WHAT: Free WSRE Public Square event and book signing: “Blue Revolution: A Water Ethic for Florida.” Barnett demonstrates how one of the most water-rich states in the nation could come to face water scarcity and quality woes – and how it doesn’t have to be this way. She will be signing copies of her books, “Blue Revolution” and “Rain,” following the program. Books will be sold at the event. WHEN: 7 p.m. Tuesday, April 23. 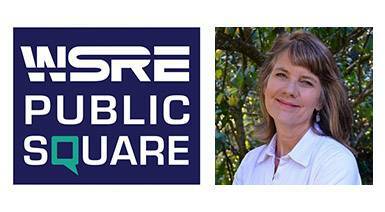 Doors open at 6:30 p.m.
WHY: WSRE Public Square presents public talks on topics related to the arts, science, education and media. This presentation by Barnett is funded in part by a Florida Humanities Speakers Series grant awarded to Pensacola State College, WSRE’s licensee. The Florida Humanities Council partners with community organizations around the state. Support is provided by the Florida Humanities Council with funds from the Florida Department of State, Division of Cultural Affairs. HOW: Admission is free. Visit wsre.org/speakers to register learn more. Cynthia Barnett, author of “Blue Revolution: Unmaking America’s Water Crisis” and “Rain,” will give a public talk at the WSRE Jean & Paul Amos Performance Studio on Tuesday, April 23.